Google is going to announce the Android L soon and the Android L Developer Preview was available for Nexus 5 Smartphone and another Nexus 7 Phone. The Android 4.6 Beta ROM built by Paranoid Android Rom Developer, Yes! Samsung officially stopped giving updates to the Indian Samsung Galaxy S3 but there are many Developers who provided Android KitKat for Samsung Galaxy S3 International version as well! Disclaimer : Neither Droidmen site nor the Author will be responsible if there is any problem which takes place at the time of following this guide! There are very less chances that the device may go through some problem, if so then you can contact us via contact page or comment telling your problem. But we won't be responsible for any problem if it occurs. 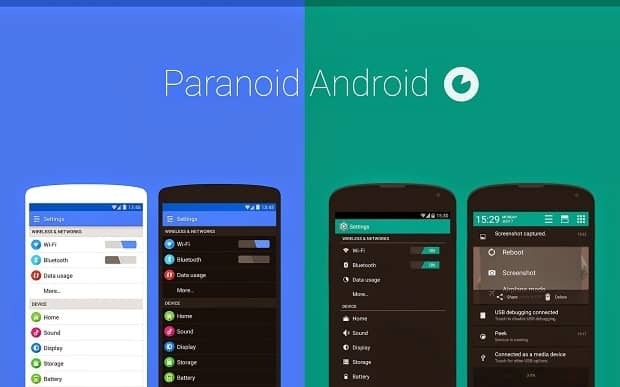 The Android 4.6 Paranoid ROM is based on the Features of the Android 4.4 KitKat and the Android L Developer Preview, It is not exactly an Android L ROM for the Samsung Galaxy S3 but it has most of the Features which are adopted from the Android L Developer Preview for Nexus 5. So in this step you will be checking whether the S3 version you are using is compatible the Android L based Android 4.6 ROM for Samsung Galaxy S3 or not. Go to Settings » About Device » Model Number and check that the model number of your Phone. If the Model number of the S3 you are using is GT-I9300 then your device is compatible with the ROM. If you haven’t rooted the Samsung Galaxy S3 you own, then get it rooted before trying it because without the access to the root you cannot install custom ROM. Without rooting the SuperUser will not grant Root Access and without Root access you cannot install a Custom ROM. Well, if you think that you would mess up at the time of installing the ROM, then you can make a Nandroid Backup, Nandroid Backup will take the backup of the entire ROM in your Smartphone, and at anytime if you mess up while installing the ROM and if you are able to boot into recovery mode then you can get back the ROM of which you took the backup. And to take the Backups of contact you can either sync the contacts with your Google account or you can export a vcf file to your SD Card. If you want to take an App Data Backup then you can use “Orange Backup” or “Helium App” for taking the backup of the App data, so that the app data can be used after installing the new ROM also, You can make a Google Search so that you can get easy tutorials of Helium and Orange App. Well rooted the phone? took the backup if you want? now let’s begin with the installation of ROM, as mentioned above use the Android 4.6 ROM and GApps which you’ve downloaded from the above link, if not then go above and download them because you cannot do anything without it ! Don’t know the Key combinations? Don’t worry use this – “Reboot into Recovery mode without pressing buttons”. Make the Factory Reset in CWM Recovery and if you are using TWRP Recovery then make a Full Wipe. If you have a device working on Android 4.5 P.A then Don’t wipe the data. – For TWRP : Press Install. Search for the Location where you Placed the Paranoid Android 4.6 zip file and Confirm the installation. After installing the Android 4.6 ROM, Install the GApps. On clicking Reboot the Phone the phone will start the booting process. It will take some time for the First time, After the boot process gets completed Sign in with your Google account and Start using the Android 4.6 Paranoid ROM. In case if you face some issues at the time of installing the ROM you can try following the steps again and if you are unable to install it even after following the steps again then you can restore the Nandroid Backup you made so that you can use the Phone in a normal state again operating on the Previous ROM.